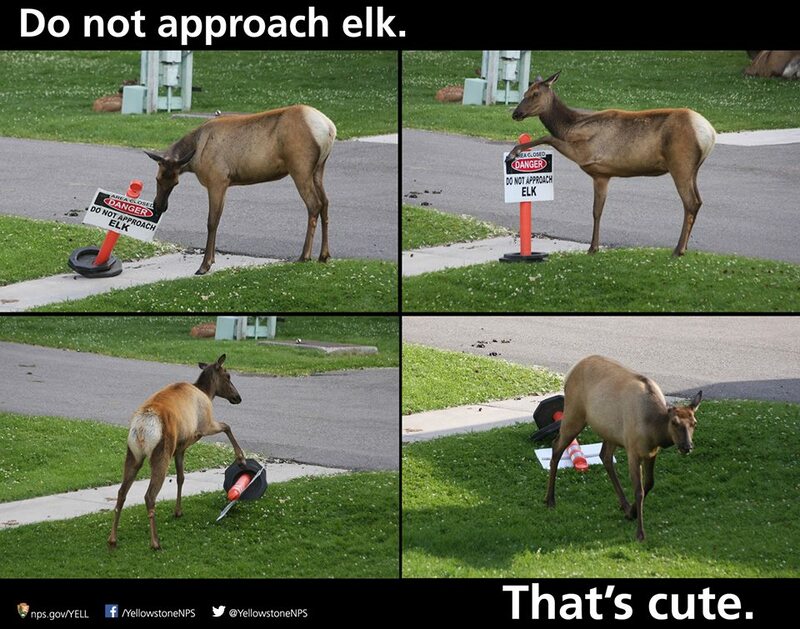 Elk have quite the sense of humor to go with their size and general dangerousness. I lifted this picture from Yellowstone National Park’s Facebook page August 30. So I thought I’d do a little research. What exactly are the dangers lurking in these unassuming national parks? How can we protect ourselves? Here’s what I found: A little common sense goes a long way. See a bear off in the valley? Don’t go running after it with camera in tow. Is an elk camped on the side of the road leisurely munching grass? Take a through-the-window shot and keep it moving. Does that big bison look like he couldn’t move fast enough to harm a fly? Think again. Avoid an encounter with a bear. Hike in groups and make a lot of noise. Lacey and I intend to sing. It’ll be a karaoke hike. If you do encounter a bear, know how to react, If it charges you, you need to defend yourself. If you just startle it and it starts acting a little like its trying to make a big show, just back away. Don’t try to out-alpha it. Know how to use your bear spray — and what it’s limitations are. Its not insect repellent, as the park service is quick to point out. Think of it more like super-mace. You don’t want it anywhere near you. Yellowstone also provides a nice elk safety video — basically don’t walk up to them or park your car next to them. So, Toni and Sandy. Your daughters are armed with cutting edge National Park safety technology. I think we have a 99 percent chance of survival in the wild, wild west.